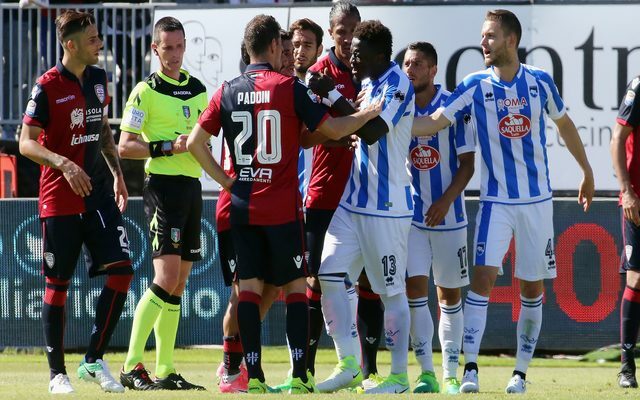 Sulley Muntari walked off the pitch during Pescara’s clash with Cagliari on Sunday after being booked for reporting racial abuse to the referee. The 32-year-old heard chants during the game and informed referee Daniele Minelli to stop the game. However, his protests fell on deaf ears as he was booked before marching off the pitch and remonstrating with some fans in the stands. Pescara ended the game with 10 men after he refused to take part, but he continued to try and spread his positive message after the game. “You saw what happened. The fans were chanting at me during the first half,” he told Premium Sport. The former Portsmouth and Sunderland midfielder has played in Italy for a number of years and this shocking event will undoubtedly deeply sadden him and reflects badly on the referee, supporters and game as a whole with more needing to be done by the officials and powers that be to stamp racism out altogether.